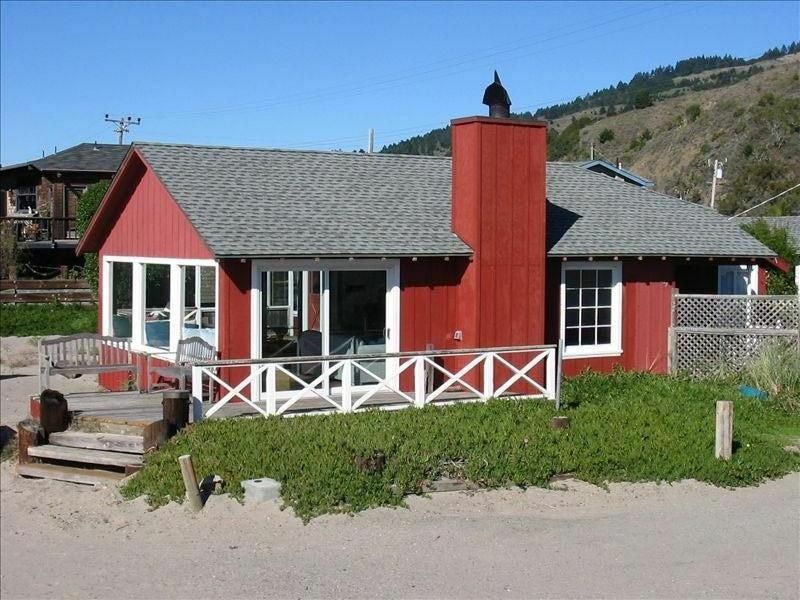 Stinson Beach, California, is less than an hour away from San Francisco. Think of it, you could be sitting on the beach, your feet in the water, and sand crabs biting at your toes. The house sits directly on the beach with clear views of the ocean and the mountains. Most people come here to simply vegetate in the sun, but there's also, should you be so inclined, hiking in the nearby mountains, walking aimlessly on the beach, or body-surfing in the waves. Rentals run Friday to Friday. The house has three bedrooms. The master bedroom with a king size bed; the back bedroom also with a king sized bed; and lastly, a bedroom behind the living room, with two single beds. Additionally, the living room has three double beds and a couch in front of the fireplace. There are two bathrooms, one full bath and one three-quarter bath. The full kitchen has a microwave, coffeemaker, and two refrigerators. Extra special feature: NO TELEPHONE! Thing about it, if your boss expects you to be on call during your vacation, you have a legitimate excuse not to call in. If you absolutely have to have a telephone, you can bring your own cell phone or you can use the public phone in town. Paypal accepted. One house back from beach. 10 steps to beach across end of private road. Mount Tamalpais in the background. Rentals Run Friday to Friday. Amazing home on the beach!!!! We rented this house this past weekend for my sons wedding. We were staying near several family members who had booked other rental houses close by. I was a little worried about this place because i saw a review which mentioned mold....but everyone else seemed to like the place, so thought we'd give it a whirl. Upon arrival, i was extremely excited! The views and location can not be beat. It is truly beachfront. The house itself was amazing and spacious and had everything we needed. My one and only complaint is that we actually had to leave when the weekend was over!! The kids loved sleeping in the beds along the picture window. And the "mold" that someone complained about.....non existent. the musty smell in the "ping-pong room" is aired out quickly by opening the doors. The floor is pourous concrete and is hosed down by the cleaning staff to remove sand. The kids and adults enjoyed this room and i had to pry them out of there when we were leaving..."one more game, mom, pleeeeeease!!!" is all i heard! Matthew was extremely kind and easy to deal with, very personable. All i can say is that if you do not stay here, you are definetly missing out!!! I am disappointed that we didn't have more time to spend here, but we are definitely going to stay here again in the near future! We Love this beach house!!! We have rented this house in the past, but had to go elsewhere when the family grew. Made the decision to return with our family of nine and we are so glad we did. This is a true beach house right in the sand with incredible views. Very large living area with lots of comfy seating, large fireplace all set and ready to light, and wonderful table for dining and games. Huge country kitchen with all the necessities and extra refrigerator in the garage,aka "ping pong room". We actually enjoyed the week more with no tv, wireless and phone. Loved being close to town and shopping and having a hot tub. Easy dealing with Matthew and being able to use Paypal. Already have our week set for next year! We rented this house for what turned out to be a very stormy/wet weekend. The view was terrific of the storm rolling in. Loved the great room and the three beds along the big picture window. I could have stayed there for days taking in the view.Loved the layout of the house. The teenagers slept in the great room and the adults slept in the very comfortable bedrooms. Kitchen was great but you might want to bring some extra plates if you have a larger group so you do not have to run the dishwasher often. Owner was very accommodating and helpful. We may rent it again. Great location too. This is a wonderful house for families and friends. We stayed for a week in August, retired couple, adult son, daughter, and daughter's boyfriend. Various friends of ours and our children came and went throughout the week. All enjoyed themselves thoroughly. The house is as described. The living room and the kitchen are both very large spaces, accommodating a large group together or smaller groups doing different things. The electric organ in the LR is an unexpected bonus. The photos are accurate. The house is well-equipped with dishes, pots, pans, extra refrigerator in former garage – great for keeping a week's food and drink, ping pong table, patio with bbq and hot tub, sand toys for the young and boogie boards and disks for the surf. Being on the beach is the best. We appreciated seeing the beach and water first thing in the morning and last thing at night. It's really great to take our morning coffee out to the deck or directly to the beach. We had many long walks on the beach. Bodysurfing and then into the hot tub. We saw so many dolphins and seals right at the surf line. The house is rented without sheets or towels but they were provided for a nominal charge. The two king size beds in the large bedrooms were very comfortable. A couple of the twin beds weren't quite so good. I had wondered how it would be with no phone, no internet, and no TV. It was heavenly. We spent much more time doing things together and talking together without the screens. Initially it was a little hard to get in touch with Matthew, the owner. However we found that he was very helpful and responsive. He answered all our questions and arranged to accept our credit card payment through Paypal. He also promptly returned our deposit. My whole family unanimously recommends this house and property owner. We look forward to staying again next year. Rates are subject to change until reservations are confirmed. Minimum rental period during the June-August timeframe is one week. Minimum stay during Thanksgiving and Christmas is one week due to demand. Rentals run Friday to Friday.